I love entertaining in the fall. It's a busy time of year—back to school, back to team sports, back to PTA volunteering—so it's important to take time out to socialize and enjoy the season's simple pleasures. Crisp, cool weather; evenings around a wood fire; hot apple cider with a cinnamon stick; the changing color of the leaves...and, of course, apples. In my book, if you want to highlight the deliciousness of an apple, you should pair it with a sharp cheddar like Kraft Natural Cheddar Cheese. 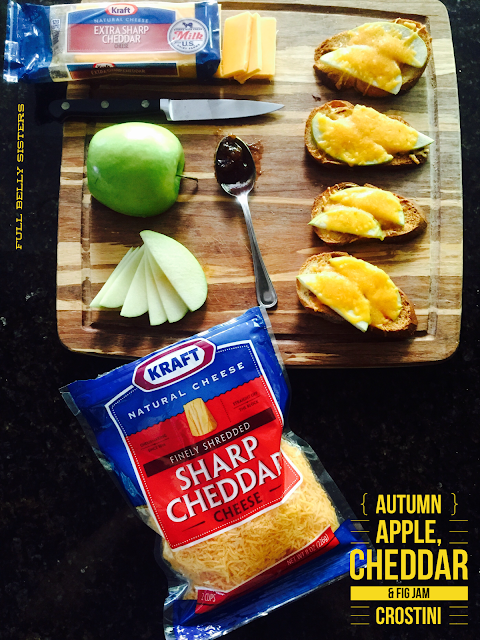 Autumn is delicious in so many ways! 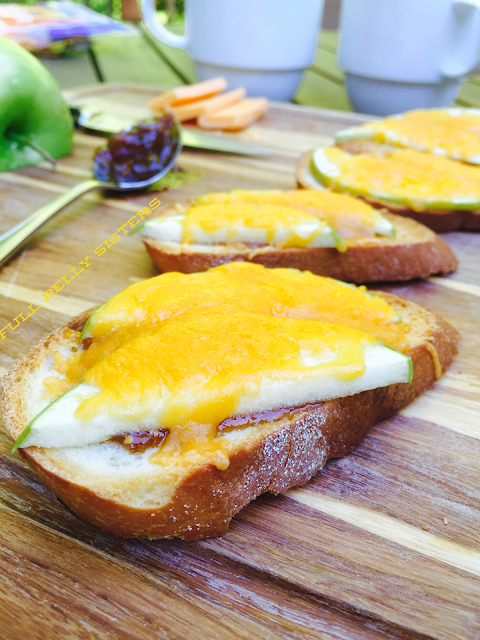 To celebrate this most wonderful of seasons, I've made a lovely crostini: toasted baguette, fig jam, thinly-sliced apples, and Kraft Natural Finely Shredded Sharp Cheddar Cheese melted over everything. It's a simple, seasonal, and beautiful snack that gives you plenty of time to be with your guests. You can make as many or as few of these nutritious crostini as you need. Having a friend over to hang out while the kids are at school? Make just a few crostini. Having a couple of families come back to your house after the kids' soccer game? Make the whole baguette! 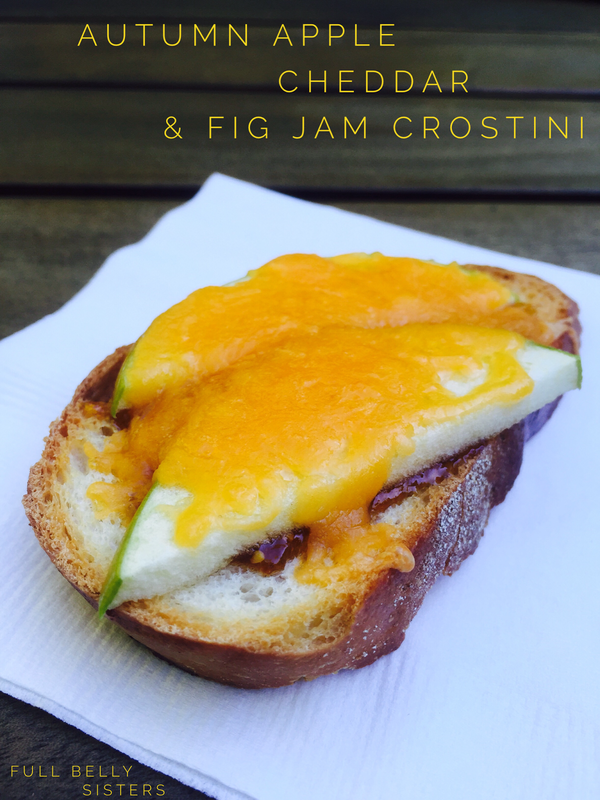 For each crostini, you should figure: one slice of baguette + 1/2 teaspoon fig jam + 2 thin slices of apple + 1 Tablespoon Kraft Natural Finely Shredded Sharp Cheddar. Preheat your oven to 375 degrees. Brush each slice of baguette with some olive oil and put on a baking sheet. Bake for about five to seven minutes, until the bread is golden brown, then flip and bake for about five more minutes, so that both sides are toasted. Take out of the oven and, on each toasted slice of baguette, spread fig jam. 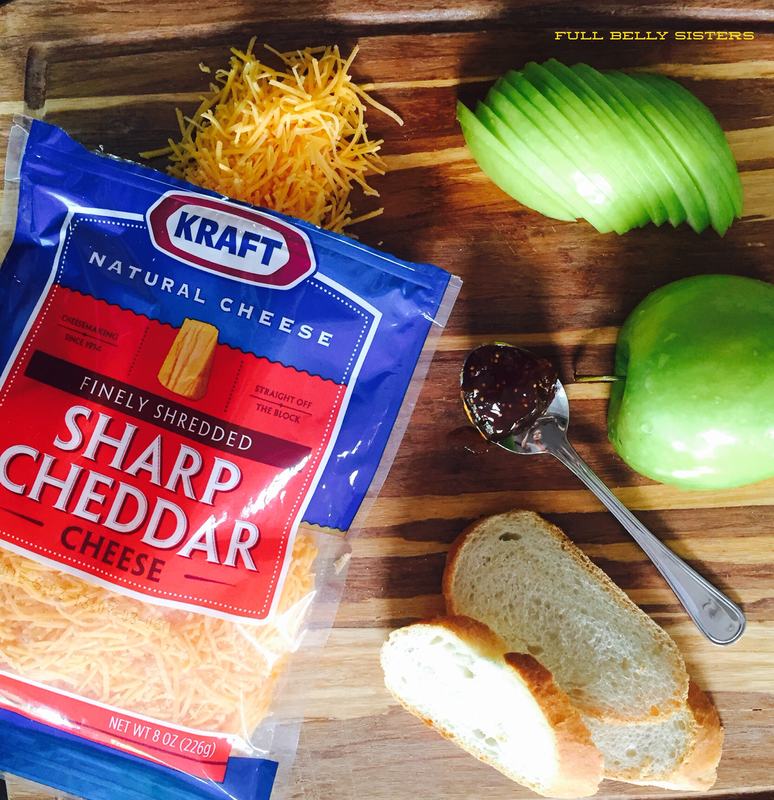 Place apple slices over the jam, then sprinkle the Kraft Natural Finely Shredded Sharp Cheddar over the top. Place the sheet of crostini back in the oven and bake for about three to five minutes, until the cheese is fully melted. Remove from the oven and serve right away. I served mine out on our deck, alongside some mugs of hot apple cider. Autumn rules! Have you ever had a piece of apple pie with cheddar on top? Well, this wholesome crostini tastes just like that—a wonderful mix of sweet and savory, toasty and creamy. Such a satisfying and easy approach to fall entertaining, right? I love simple meal solutions that look good but require very little energy. I even use the cutting board (on which I sliced the apple and baguette) as a serving platter. The less time spent in the kitchen, the more time you've got to sit with friends and family and just soak up the season. 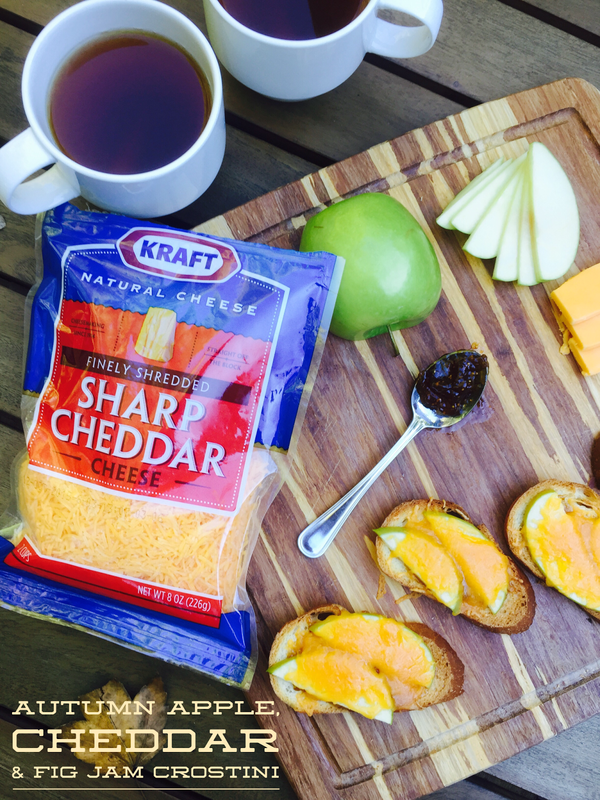 To that same end, I like to put out some extra slices of the apple, as well as a block of Kraft Natural Extra Sharp Cheddar Cheese on my serving platter. That way, when the crostini runs out, guests can just nibble on the apple and cheese—and I don't feel pressure to run back into the kitchen.